From a personal blog post, ‘Tunnel truths’, we learn of Council for British Archaeology (CBA) trustees being guided by National Trust and Historic England representatives on a tunnel tour of the Stonehenge landscape. The National Trust’s Archaeologist for Stonehenge and Avebury reblogged this post and @HistoricEngland and @EH_Stonehenge retweeted it, as did someone from English Heritage PR. This influentially placed support appears to be endorsing the impressions recorded in that blog, giving rise to concerns about what the CBA made of it all, because the case as presented doesn’t hold water. It is claimed a tunnel had been accepted in principle a decade ago: but not quite by the CBA or National Trust it hadn’t, as a 2006 press release made clear. It is asserted that ‘Outstanding Universal Value’ is something new, but it is fundamental to the 1972 UNESCO World Heritage Convention. An attempt is also made to dismiss as ‘premature’, concerns about threats to the archaeology at Blick Mead. There are, however, genuine fears for vulnerable spring-associated organic remains and the prehistoric land surface which is rare in apparently being well preserved. The extent of the site is unknown and could conceivably run beneath the A303 carriageway. It is therefore not unreasonable to express concerns when adverse impacts could result from a graded junction at Countess Roundabout and tunnel entrances at King Barrow Ridge that might require piling for an elevated road section nearby. Surface water disposal and temporary and permanent effects of tunnelling might also have dramatic effects on the water table, again affecting the site and its archaeology. Let us not overlook that the importance of Blick Mead is only now being recognised, powerfully demonstrating how little is known about this World Heritage Site (WHS) whose caretakers are advocating potentially devastating portals and infrastructure. No mention is made of a radical initiative to divert the A303 route to mop up Salisbury’s traffic problems as well. It apparently wouldn’t add significant mileage and would be far cheaper than any tunnel. This idea may come to nothing, or it could prove a game changer, but for the sake of the WHS it deserves to be given every possible chance. One usually protects and cares for in its entirety whatever is loved and considered truly precious: family, home, paintings, books, even landscapes. 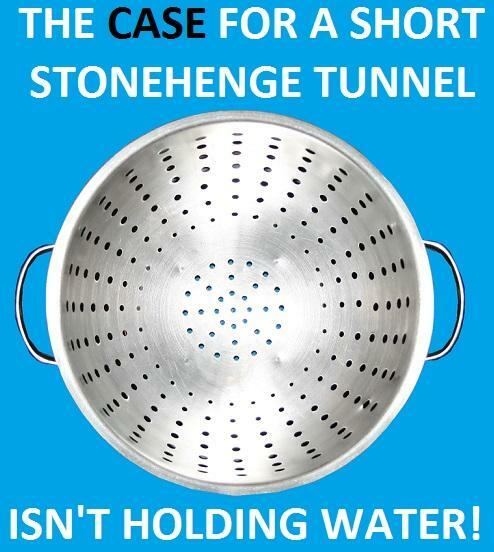 Caring for the Stonehenge WHS simply doesn’t equate with support for a tunnel proposal that would destroy large areas of protected landscape for road engineering, whose purpose may be short-lived in the timescale over which Stonehenge is valued.